We buried my father in law yesterday. It was a bittersweet day. He lived his 90 years focused solely on his family. He was healthy most of his life up until about four years ago, when dementia slowly kept into his world. This affliction slowly chipped away at his memory, physical body, dignity and his strength like an ever so patient whittler working on a block of wood only it did not create something beautiful. It was a ruthless robber leaving an empty shell but my father in law’s pride gave it a heroic fight. You could look into his deep dark brown eyes and see just enough defiance, as if to say, “no, that’s enough!”…. By the way, that simple phrase followed him throughout his life, as though it were his call to arms for anything that stood in his way. His life was not an easy walk in the park. He is one of the many courageous southern Italian immigrants who made their way, no, fought their way, to this country to make a difference for thie families. And my father in law did make a difference. It was because of his bravery and determination to stand up against the many struggles he faced from the moment he set foot on Ellis Island, leaving behind all that was familiar to him and transposing into a new life with a wife and small child that his family grew and flourished and realized the American Dream. To see and be a part of this life through my husband, Sam, and our children makes it all the more meaningful. The second love of his life was growing tomatoes in his garden and the family ritual of making and canning sauce for the winter at summer’s end. I can’t begin to tell you how much joy this gave him. 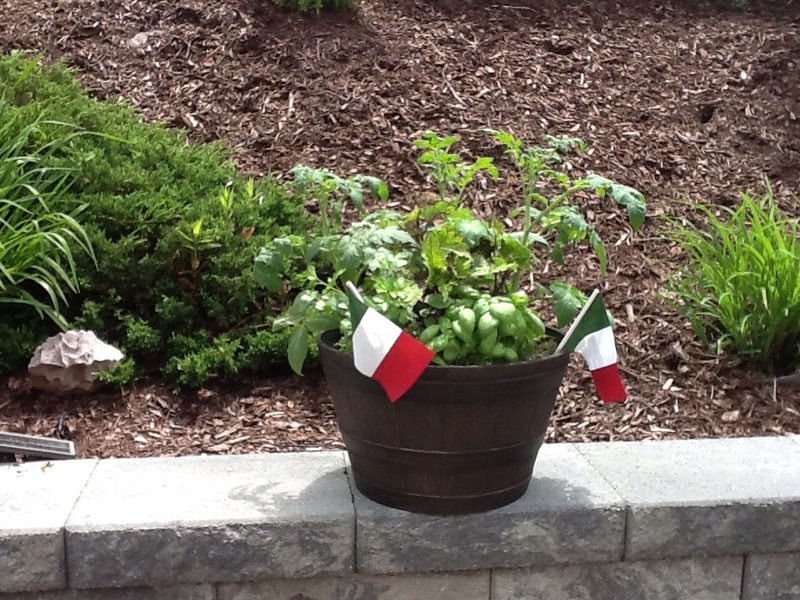 So as our tribute to this gallant, stouthearted patriarch of the Russotto Family we put together a planter of tomato plants, basil and parsley rather than the traditional bouquet of flowers. We know this has a deeper meaning as far as expressing our sense of loss to a life well lived with love, dignity, gratitude and humility.